Mention Portugal and you may think of the Age of Discovery or an endless coastline of craggy Atlantic beaches. Most people think, “Romantic, but probably beyond my budget.” Not so. Start in Lisbon to begin your love affair with Portugal—because that’s exactly what it will be. On arrival, you’ll find convenient transportation. Taxis line up at the airport and charge an initial start rate of about $4. The 25-minute drive to town costs about $15. Expat Annette Ford Rio loves other options for seeing the city. “The trains, trams and ferries… the public transportation system is great.” Purchase a Lisboa Card and you’ll not only be able to ride Lisbon’s transport network everywhere, but also gain free access to museums, palaces and other sites of interest. The dining-out spectrum in Lisbon is wide. You can spend up to $60 a person for dinner for two at Tasca da Esquina, a tapas-style restaurant with creative offerings where, if you’re feeling adventurous, you can sample an octopus, sweet potato and peppermint platter ($12.50). But why not head to the Campo de Ourique market, where the locals shop? Pick up fresh fish and meats, vegetables, fruit and baked goods, then prepare simple meals in your rental. Or enjoy a full meal at the market, with wine, for about $11. Consider basing yourself in Almada. It’s 30 minutes by bus to Cais do Sodré train station in Lisbon. Or if you’ve rented a car, it’s just eight miles across the 25 de Abril Bridge to the popular Belém district. Belém is home to the Tower of the same name, the Maritime Museum and the medieval Jerónimos Monastery, among other attractions. 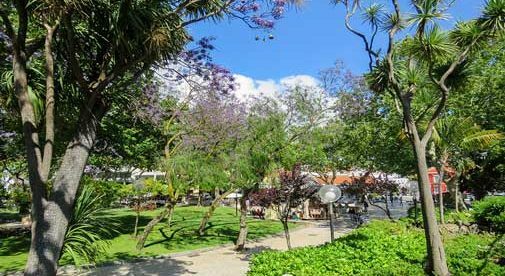 Although day trips are easy, Almada has its own low-key charms for a longer stay. One is the Sanctuary of Christ the King monument at the 25 de Abril Bridge. Inspired by the Christ the Redeemer monument in Rio de Janeiro, it offers arguably the finest view of the city of Lisbon. Pay $6 to take the elevator up, snap your photos, sip a beverage in the café, and visit the chapel for free. Then head to Parque da Paz. Here you can picnic under the trees and relax by the lake, watching the ducks and geese, or stay in shape on the fitness track and hiking trails. There’s also a fine kiosk serving up cold caipirinhas, the classic Brazilian cocktail. For seafaring sorts, the Fragata Dom Fernando II e Gloria, Portugal’s last sail-powered ship, is in nearby Cacilhas; it’s conveniently situated next to the tram, bus and ferry terminal. Adults pay $5.50 (those over 65, half-price) to climb aboard and dream of life on the high seas. If you’re in need of a little retail therapy, check out Almada Forum. Browse in H&M and Zara, pick up groceries at Hipermercado Jumbo, or choose from the food court selections for takeaway. There’s even a beauty salon and a cineplex showing movies in English with Portuguese subtitles. Where is Lisbon on the Map?